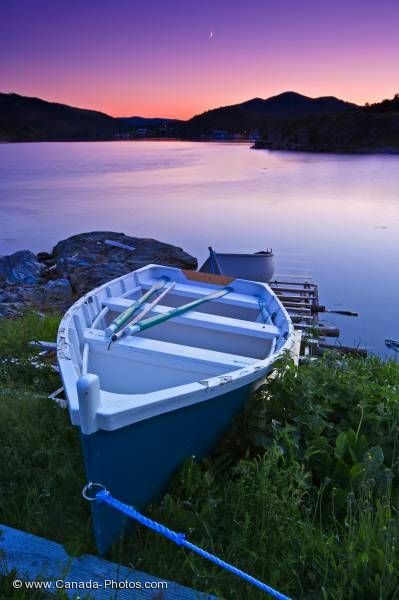 A nicely painted boat hauled up onto the coastline in Fleur de Lys, Newfoundland as a pink colored sunset adorns the sky. The pink sunset colors silhouette the coastline hillsides in the town of Fleur de Lys in Newfoundland, Canada with the water appearing to have a pink tinge to it as well. On the wooden ramp along the rocky coastline, boats can easily be pulled out of the water after a day of fishing in the Baie Verte Peninsula. Picture of the coastline of Fleur de Lys, Newfoundland at sunset with a boat in the foreground.